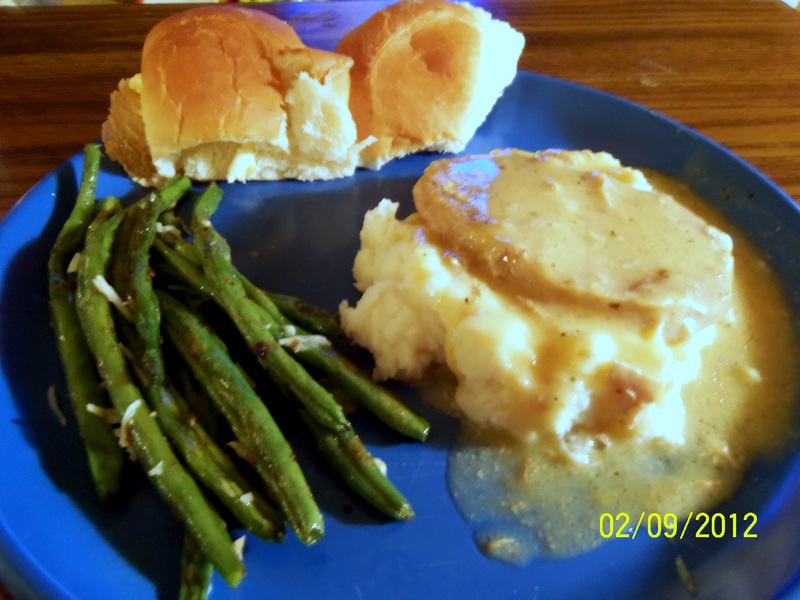 Ranch House Crock Pot Pork Chops and Parmesan Mashed Potatoes | Mommy, I'm Hungy!! Man, did I make a good dinner tonight!! I have to admit that I cheated and used instant potatoes rather than making them per the recipe because I lost track of time and by the time I got in and remembered I needed to peel and cube the potatoes, it would have taken too long to make them, but I do plan on making them next time I make this recipe! I did however, add to the instant potatoes the garlic and parmesan cheese and it was yummy!! Here’s the yummy and extremely simple recipe for the pork chops!! Scoop mashed potatoes onto serving plates and top with pork chops and soup gravy from crock pot. Preheat oven to 350 degrees F. Place bulb of garlic with skins on, wrap lightly in tin foil and bake for 1 hour. Remove from foil and let cool for 15 minutes. Remove garlic from skins, place in a bowl and mash with a fork until completely mashed. Set aside. One garlic bulb will have around 12 cloves. Make the roasted garlic as directed above. Make potatoes as directed on the package. As they start to thicken, add the mashed garlic cloves (I used 8) and the parmesan cheese (I used 1/2 cup instead of 1 cup because I don’t think the amount my package made was as much as the recipe would have made) and stir until well blended. This is what you end up with….a delicious meal that will be demolished in minutes!! I made Roasted Parmesan Green Beans to go along with this and everything was absolutely delicious and will definitely be made again! Let me know if you make this delicious dinner and how you like it!! I would love to hear back from you!